This artist’s impression shows the newfound potentially habitable alien planet HD40307g in the foreground, with its host star and two other worlds in the six-planet system also depicted. The atmosphere and continents shown are neither detected nor constrained by the discovery team's observations. From massive bodies that fell just short of becoming stars to the tiniest solar systems known, 2012 has brought an array of intriguing exoplanets to light. And double-star systems that once seemed unlikely to host planets have produced a wealth of them this year. In the fall of 2012, astronomers announced two new planets, discovered separately, that may have the potential to support life outside of our solar system. Both planets were found in the habitable zone of their stars, the region where a planet could hold liquid water on its surface. Water is thought to be a key ingredient in the formation of life. Artist's rendition of the "super Earth" Gliese 163c, which may be capable of supporting microbial life. HD 40307g is the most distant of the six planets in its system, taking approximately 200 days to orbit its star. Its distance means that it isn't tidally locked, with one face perpetually turned toward its star, making it more likely to have Earth-like conditions. Because the planet is only 42 light-years away from Earth, it could potentially be imaged by telescopes in the future. Its parent star is smaller and dimmer than the sun. Gliese 163c also lies within its star's habitable zone, although it skirts the edge. Like HD 40307g, it is approximately seven times the mass of Earth, and could be a large rocky planet or a smaller gas giant. The planet orbits a red dwarf that is slightly dimmer than our sun, flying around it once every 26 days. 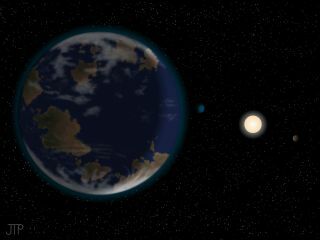 Depending on its composition, Gliese 163c could host an ocean and a dense atmosphere, or it could be too hot for life to exist. Both planets were found using the High Accuracy Radial Velocity Planet Searcher, or HARPS, the European Southern Observatory's telescope located at the La Silla Observatory in Chile. A number of double-sun systems were discovered in 2012, but perhaps the most astonishing was found by amateur astronomers. The gas giant PH1 orbits a pair of stars that are part of a four-star system, the first discovery of its kind. A close binary set of stars with masses about 1.5 and 0.41 times that of the sun, the twin stars at the core of the system dance around each other every 20 days. Two more stars circle the pair at about a thousand times the Earth's distance to the sun. Circling the central pair once every 138 days, PH1 is a gas giant, with a temperature ranging from 484 degrees Fahrenheit (251 degrees Celsius) to 644 F (340 C). Just bigger than Neptune, the planet could potentially host rocky moons, but such moons would also be too hot for liquid water. PH1 was discovered by two amateur astronomers participating in the citizen scientist program Planet Hunters. A dip in the light from the system signified the potential presence of a planet, which was then confirmed by a team of professional astronomers. Scientists discovered two separate binary systems this year with planets that lay near their habitable zone. Often referred to as "Tatooine planets," due to the famous double-star-system home of Luke Skywalker in the film "Star Wars," planets orbiting a binary star system have two suns overhead. Kepler-34b and Kepler-35b are particularly notable because they lay near their stars' habitable zone. Kepler-34b is a gas giant with almost 70 times the mass of Earth. It travels around two sunlike stars once every 289 days, staying about as far away as Earth stays from the sun. It lies 4,900 light-years from Earth. Kepler-35b weighs in at about an eighth of Jupiter's mass. It takes 131 days to travel around its parent pair, which are both slightly smaller than the sun. The system is only 5,400 light-years from Earth. Both systems were found using NASA's Kepler space telescope. In another double-star system twist, two planets were found orbiting a binary pair, the first time multiple planets have been seen around twin stars. The Kepler-47 stars are 5,000 light-years from Earth. One is sunlike, while the other is smaller and fainter. They orbit each other once every 7.5 days. Kepler-47c is a gas giant that takes 303 days to circle its suns, and rests in the habitable zone of its stars. Although it is considered unsuitable for life, its existence means that other planets could survive in the habitable zones of twin-star systems. It could also host rocky moons that have the potential for life. Kepler-47b takes less than 50 days to orbit the pair of stars. Only three times the radius of Earth, it is the smallest known planet orbiting in a binary system. Scientists think the rocky planet may be a sweltering world with a thick atmosphere. Earth's closest star system, Alpha Centauri, hosts a molten terrestrial planet, scientists found. A rocky planet orbits Alpha Centauri B, one of the three stars in the system with 90 percent the mass of the sun, once every 3.2 days. The planet passes within only a few million miles of its star, hovering at a tenth of the distance between Mercury and the sun. Although the overheated planet likely has a scorched surface too hot for life, scientists think the system has the potential to contain other planets. Only 4.2 light-years from Earth, such planets would be easier to image with telescopes in the not-too-distant future than more faraway candidates. Astronomers used HARPS to identify the nearby planet. Most of the newly discovered planets have been "super"-size: super-Earths, super-Jupiters, and so on. Larger planets are generally easier to find. But three new planets only a fraction the size of Earth, including one Mars-size body, make up the smallest alien system found to date. Kepler found the planets orbiting their star KOI-961 between 0.6 to 1.5 percent of Earth's distance to the sun, tearing around the red dwarf in less than two days. The rocky bodies have temperatures ranging from 350 F (177 C) to 836 F (447 C), resulting in broiling hot surfaces unlikely to support life. The three planets have diameters 0.78, 0.73, and 0.57 times that of Earth, with the smallest being Mars-size. Kappa Andromedae b, or Kappa And b, is a massive planet that came in just shy of the ability to be a star. The gas giant, which is 13 times as massive as Jupiter, fell just short of having enough mass to be classified as a brown dwarf, failed stars too low in mass to sustain fusion in their core. Astronomers were able to take a rare direct photo of the planet using Japan's Subaru telescope at Mauna Kea in Hawaii.The wannabe star orbits Kappa Andromedae, a star 2.5 times as massive as the sun that lies 170 light-years away. Circling the young star at almost twice Neptune's wide-reaching orbit, Kappa And b averages 2,600 F (1,400 C) and would appear bright red if seen up close.